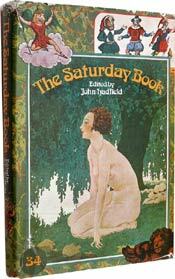 The Saturday Book was an annual miscellany that featured art, literature and comment on British life during World War II and the decades that followed until 1975. The series was initially edited by Leonard Russell with John Hadfield taking over the reins in 1952. Each edition of The Saturday Book provides a wonderful glimpse into the culture that shaped a nation with contributions from some very talented individuals. Readers were treated to short stories, poetry and art from the likes of Evelyn Waugh, P.G. Wodehouse, Graham Greene, Siegfried Sassoon, John Masefield, Cecil Beaton, Edward Ardizzone and Robert Gibbings. The books were designed for casual reading and contained both serious and frivolous content with real English flare. Copies of The Saturday Book are fairly easy to find but the early volumes are scarcer partly due to the more rapid deterioration of the thinner wartime paper used between 1942 and 1945. Reading copies can be picked up less than $20.